How do researchers confuse statistical with substantive significance? 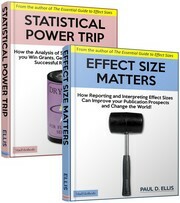 Results that are found to be statistically significant are interpreted as if they were practically meaningful. This happens when a researcher interprets a statistically significant result as being “significant” or “highly significant” in the everyday sense of the word. Results that are statistically nonsignificant are interpreted as evidence of no effect, even in the face of evidence to the contrary (e.g., a noteworthy effect size). Researchers get confused about these things when they misattribute meaning to p values. Remember, a p value is a confounded index. A statistically significant p could reflect either a large effect, or a large sample size, or both. Judgments about substantive significance should never be based on p values. It is essential that researchers learn to distinguish between statistical and substantive significance. Failure to do so leads to Type I and Type II errors, wastes resources, and potentially misleads further research on the topic. This entry was posted on Sunday, May 30th, 2010 at 11:53 pm and is filed under interpreting results, statistical significance, substantive significance. You can follow any responses to this entry through the RSS 2.0 feed. Both comments and pings are currently closed.